I love hunting for live albums and I’ve picked up some of my favorite live vinyl records during record fairs over the years. And if you’re looking to add to your record collection, or donate old records to a good cause, you should check out the 8th Annual CHIRP Record Fair in Chicago. The CHIRP Fair is hosted by the Chicago Independent Radio Project and is going on this weekend — April 10th and 11th — at Plumbers Hall at 1340 West Washington St. As in previous years, it’ll be filled with vinyl and CD dealers, poster artists, custom button makers, and more. And while you pick out your favorite records you’ll have the chance to enjoy some live tunes courtesy of Pretty Good Dance Moves, Judson Claiborne, the Loneliest Monk, while members of Alla, Mannequin Men, and Disappears spin records via DJ sets, too. CHIRP also still accepting donations of vinyl or CDs. If you have old records or CDs that you’d like to donate to CHIRP, contact Micha Ward at micha@chirpradio.org. Your donation is tax deductible, and Micha can arrange pick-ups of donated materials. 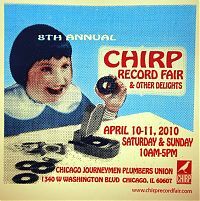 April 11th, the final day of the CHIRP Record Fair, also marks the close of their CHIRP Radio: Year One fundraising campaign. They’ll be offering limited edition thank-you gifts, including our CHIRP Radio: Year One soup mug, t-shirt, and DJ bag, are only available until 11:59PM on April 11th. The fair runs from 10AM-5PM both days, with a special pre-admission session from 8-10AM on Saturday. The pre-admission session is $25, and allows unlimited readmission for both days of the fair. General admission is $7 or $5 with an ad or flyer. FREE parking lot behind the venue. Get the latest CHIRP Record Fair news via the exclusive Record Fair Twitter feed. What are some of your favorite albums you’ve picked up at record fairs?